A dark green lawn is a sign of a healthy, well-nourished lawn. Things that factor into a healthy lawn include proper mowing practices, proper weed control, proper irrigation, and ensuring the correct amounts of fertilizer are applied. Lawns that are brown typically do not receive enough moisture. Yellowing, soggy-looking lawns are staying too wet. Lighter green and thin lawns aren't receiving enough fertilizer. Following a few simple procedures will allow your lawn to become healthy and you will be able to enjoy a lush, dark green lawn for years to come. Mow your grass every five to seven days at a height of 2 1/2 to 3 inches. Longer grass blades allow more photosynthesis to take place and allow the plant roots to grow deeper. You grass will have better access to water in the soil because of the deeper roots and will be more vigorous in growth. Fertilize your lawn four times yearly with 1 lb. per 1,000 square feet of nitrogen in spring, 3/4 lb. per 1,000 square feet in midsummer, 1 lb. per 1,000 square feet in September, and 1 to 1 1/2 lbs. of nitrogen per 1,000 square feet in early November. Apply with a broadcast spreader to ensure even coverage. Water your lawn deep and infrequently. Your lawn needs 1 inch of water per week and this can be applied over one or two waterings. Your soil should be moist down to a depth of 6 to 8 inches. Check with a soil probe and adjust your irrigation schedule accordingly since irrigation times will depend on the soil type and weather conditions. 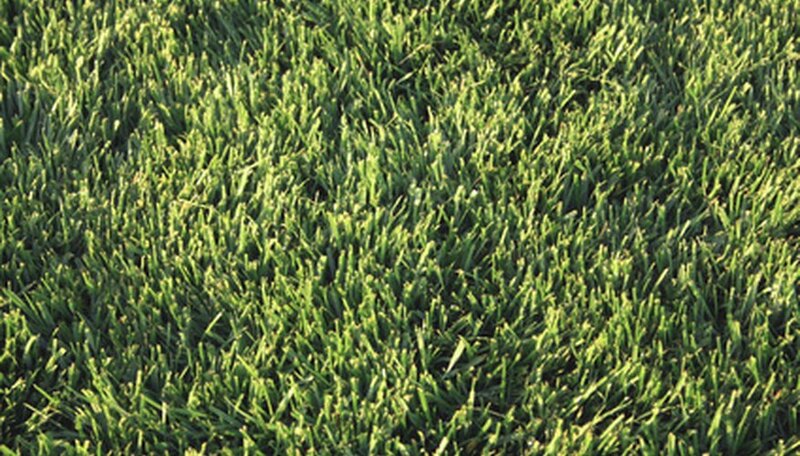 Prevent weeds in your turf by applying a pre-emergence herbicide in spring. Apply this herbicide before the soil temperature reaches 50 degrees F. A good guide is to apply it when the forsythia in your neighborhood is blooming. Pre-emergence herbicide comes in granules which you apply using your broadcast spreader. Kill existing weeds in your lawn with a post-emergence herbicide. Purchase a ready-to-use concentrate bottle and screw it to the end of your garden hose. Spray evenly over the entire lawn in spring or early fall when weeds are in their active growth phase. Total kill may require a second application. Apply fertilizers and herbicides when the wind is calm. This allows them to be applied where they are intended. Water your grass in the early morning. Calm winds and high humidity reduces evaporation and drift. Also watering your lawn in the evening may lead to disease because the grass blades will remain wet all night.